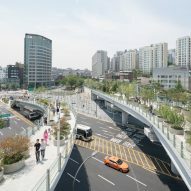 Dutch studio MVRDV has converted a former overpass into a plant-covered walkway in Seoul, which follows a kilometre-long route above the traffic. 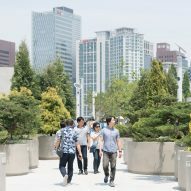 South Korea's answer to New York's High Line, the 983-metre-long park occupies a stretch of the 1970s highway destined for demolition. 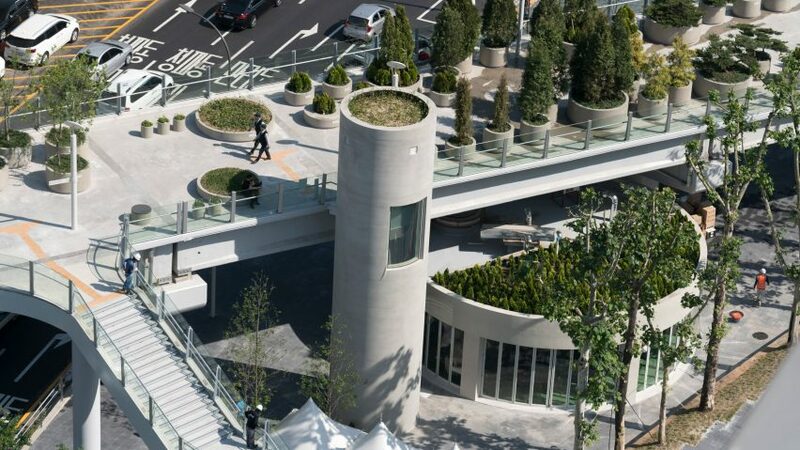 It now contains 24,000 trees, shrubs and flowers set into cylindrical planters. 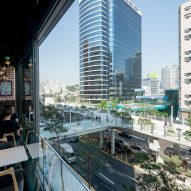 The walkway, called Seoullo 7017, is part of a wider project to made the city more pedestrian friendly. 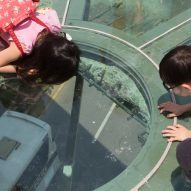 Its name translates as Seoul Street, and fuses together the years of its original construction with the renovation works. 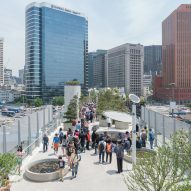 It runs over the top of Seoul Station to connect Namdaemun Market with the city's Malli-dong, Jungnim-dong and Cheongpa-dong neighbourhoods. 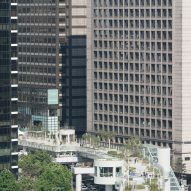 A network of bridges and stairs connect the branching 16-metre-tall concrete and steel structure with hotels and shops. 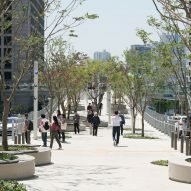 Further connections to street level and to "satellite" gardens are planned for the future. 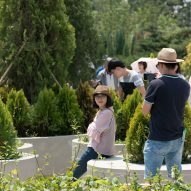 The park is also expected to serve as an "urban nursery", with plants and trees grown on Seoullo 7017 eventually transplanted to other districts. 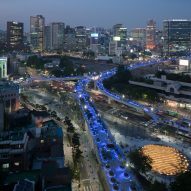 Loops of blue lighting surrounding the planters illuminate the walkway at nighttime, aiming to offer a contrast to the city's yellow-toned street lights. The hue of the lighting can be adapted to suit different events and festivals. 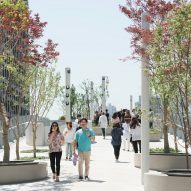 The project follows in the foosteps of the High Line, which James Corner Field Operations and architects Diller Scofidio + Renfro created in New York. The 1.5-mile park winds through 22 blocks of Manhattan on a former elevated freight railway. 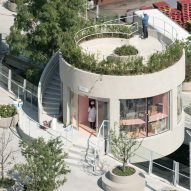 Rotterdam-based MVRDV is headed up by architects Winy Maas, Jacob van Rijs and Nathalie de Vries. 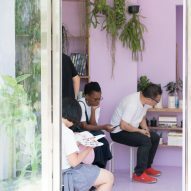 The firm came in at number nine on the inaugural Dezeen Hot list, thanks to the popularity of a number of its recent projects – including a Chanel store in Amsterdam, which features a facade made up of glass bricks. Photography by Ossip van Duivenbode.